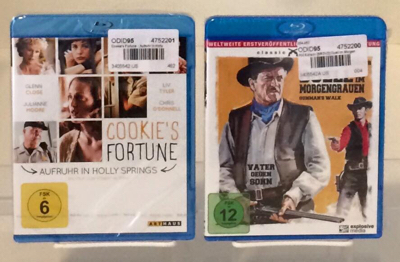 A pair of German Blu-rays made their debut in the shop today. One is a new addition to the shop’s inventory (“Cookie’s Fortune” by Robert Altman) and the other’s a western requested by one of the shop’s regulars (“Gunman’s Walk” by Phil Karlson). While no stranger to claims of signing onto a picture for a paycheck, anyone who’s a fan of Robert Altman that has seen “Cookie’s Fortune” can attest to the fact that’s absolutely not the case here. Set in small-town Mississippi and boasting the sort of all-star ensemble that’s characteristic of an Altman picture, “Cookie’s Fortune” is a film that explores racial relations without being didactic, deftly setting up situations where expectations based on racial assumptions are teased and then subverted. From a formal standpoint “Cookie’s Fortune” looks kind of like a John Sayles movie (such as “Sunshine State” or “Honeydripper”), but the characters and their relationships have a lived-in feel that’s rarely seen outside of films by the likes of Altman or Mike Leigh. While it might not make anyone forget “Nashville” or “The Long Goodbye” or “The Player” or any of a dozen other Altman masterpieces, “Cookie’s Fortune” is, in its own way, a good movie that’s worth looking into if you haven’t already.